, a very learned Italian astronomer and philosopher, was born at Verona, Dec. 13, 1662. After being instructed in the elements of education in his own country, he removed to Bologna, where he went through a course of rhetoric and three years of philosophy, in the Jesuits’ college. He afterwards studied mathematics and design, and made a great progress in both. 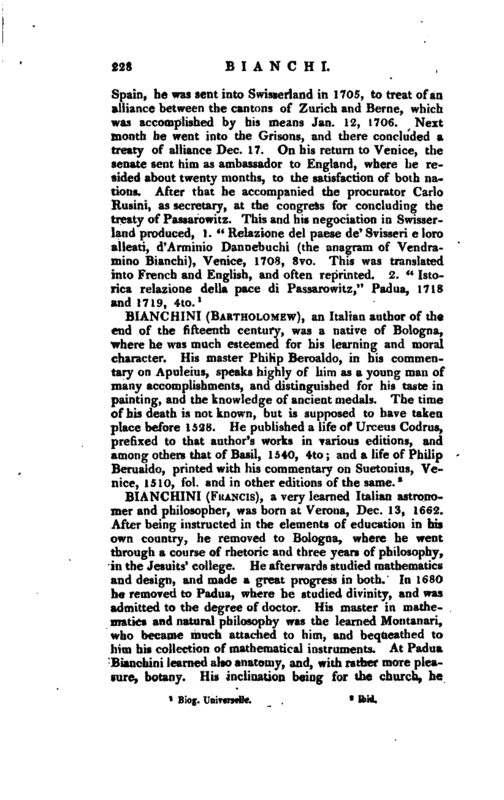 In 1680 he removed to Padua, where he studied divinity, and was admitted to the degree of doctor. His master in mathematics and natural philosophy was the learned Montanari, who became much attached to him, and bequeathed to him his collection of mathematical instruments. At Padua Bianchini learned also anatomy, and, with rather more pleasure, botany. His inclination being for the church, he | went next to Rome, where he was kindly received by cardinal Peter Ottoboni, who knew his family, and appointed him his librarian. Here, as was usual for persons with his views, he went through a course of law, but without losing sight of his favourite studies, experimental philosophy, mathematics, and astronomy. He was admitted a member of the physico-mathematical academy, established by Ciampini, and read many learned papers at their sittings. In 1686 he returned to his own country, and was very active in re-founding the academy of the Aletophili, or lovers of truth, recommending to them more attention to mathematical studies, and to assist them, he presented the society with the instruments which Montanari had bequeathed for him; but this academy entirely depended on his presence, and on his return to Rome two years after, gradually dissolved. Settled after this at Rome, he became connected with the most eminent men of his time, and enriched his stores of knowledge, by an acquaintance with Greek, Hebrew, and French. Antiquities likewise became one of his favourite pursuits. He often passed whole days among the splendid ruins of Rome, assisted at every research, and digging among them, visited all the museums, and made elegant and correct drawings of all the monuments of antiquity. On the death of Innocent XI. cardinal Ottoboni, his protector, being chosen pope by the name of Alexander VIII. continued to interest himself in the fortune of Bianchini, gave him a canonry in the church of St. Mary Rotunda, appointed him guardian and librarian to cardinal Peter Ottoboni his nephew, gave him two pensions, and would have promoted him yet farther, if he had lived, and if Bianchini would have taken orders but he had not made up his mind to take deacon’s orders until 1699, and never would proceed farther. On the death of Alexander VIII. in 1691, the cardinal, his nephew, continued his kindness, and besides bestowing a canonry on him in the cfiurch of St. Lawrence in Damaso, invited him to reside in his palace. Clement XI. who was elected pope in 1700, bestowed on him, the year following, the title of chamberlain of honour, authorized him to wear that dress of a prelate called the mantellone, and assigned him apartments in the palace of Monte-Cavallo. 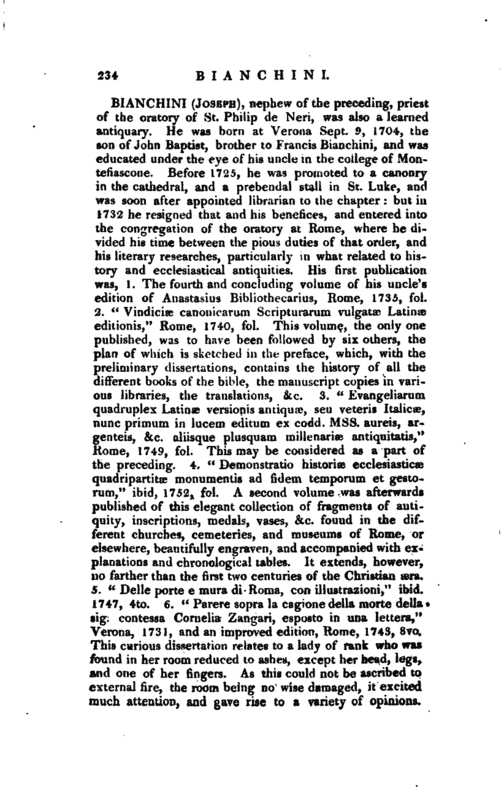 Having, in 1703, been appointed president of antiquities, he exhibited to the pope, a plan for forming a collection of sacred antiques, or an ecclesiastical museum, intended to furnish materials for ecclesiastical history but as this, would have been attended with very great expence, and the papal treasury was at this time very low, the scheme was abandoned. The pope, however, to console Bianchini, who had it very much at heart, gave him a canonry in the church of St. Mary Maggiore, and, in 1712, sent him to Paris with a cardinal’s hat for Armand de Rohan-Soubise, who was promoted to that dignity. 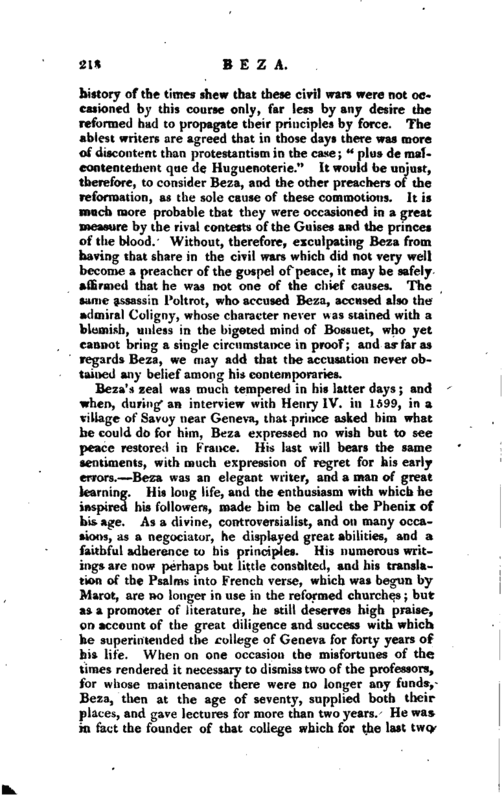 The object was trifling, but the journey was important, as serving to introduce Bianchini to the literati of France, who received him with the utmost respect. 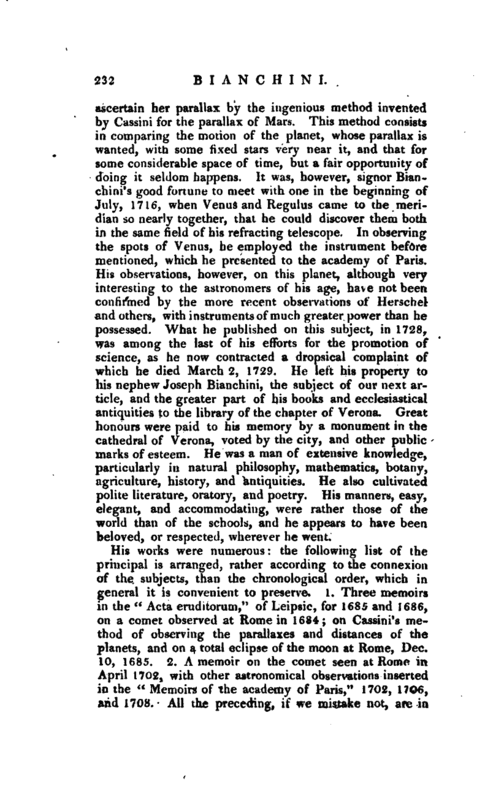 At Paris he was constant in his attendance at the sittings of the academy of sciences, who had many years betore elected him an honorary member, and he presented them witii a very ingenious improvement in the construction of the larger telescopes, to prevent those of uncommon length from, bending in the middle, an inconvenience which had been thought without remedy. 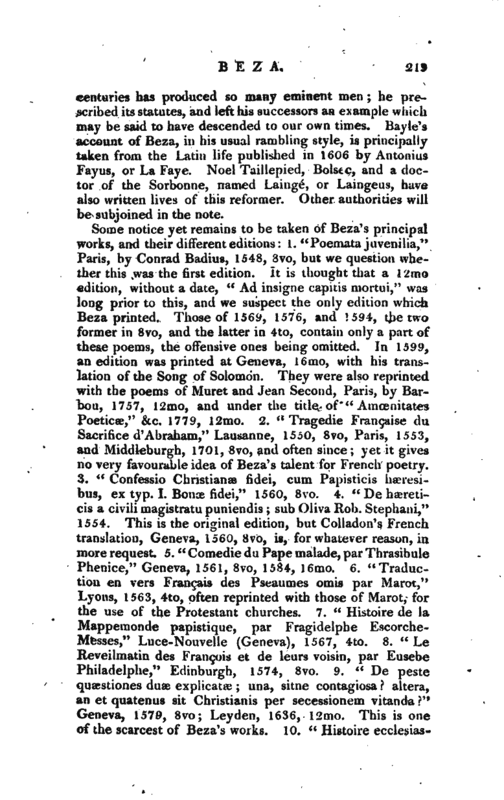 Reaumur wrote a description of this, which is inserted in the memoirs of the academy for 1713. Before returning to Rome, Bianchini took a trip to Lorraine, Holland, and Flanders, and thence into England, visiting and examining every museum and place where objects of curiosity were to be seen, and was every where received with the respect due to his talents. During his residence at Oxford, it is said that the university defrayed the expenses of his lodging such is his biographer’s ao | count, by which is probably meant that he was invited to lodge in one of the colleges. 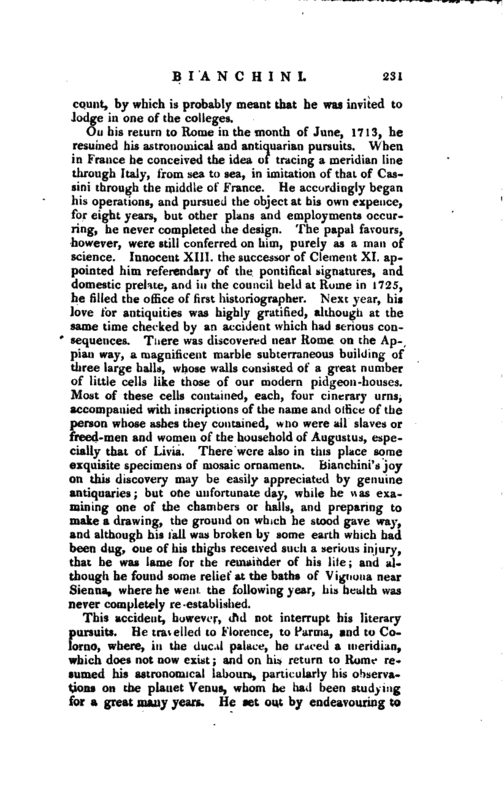 On his return to Rome in the month of June, 1713, he resumed his astronomical and antiquarian pursuits. When in France he conceived the idea of tracing a meridian line through Italy, from sea to sea, in imitation of that of Cassini through the middle of France. He accordingly began his operations, and pursued the object at his own expence, ‘ for eight years, but other plans and employments occurring, he never completed the design. The papal favours, however, were still conferred on him, purely as a man of science. Innocent XIII. the successor of Clement XI. appointed him referendary of the pontifical signatures, and domestic prelate, and in the council held at Home in 1725, he filled the office of first historiographer. Next year, his love for antiquities was highly gratified, although at the same time checked by an accident which had serious consequences. Tnere was discovered near Rome on the Appian way, a magnificent marble subterraneous building of three large halls, whose walls consisted of a great number of little cells like those of our modern pidgeon -houses. Most of these cells contained, each, four cinerary urns, accompanied with inscriptions of the name and office of the person whose ashes they contained, who were all slaves or freed-men and women of the household of Augustus, especially that of Livk. There were also in this place some exquisite specimens of mosaic ornaments. Biauchini’s joy on this discovery may be easily appreciated by genuine antiquaries; but one unfortunate day, while he was examining one of the chambers or halls, and preparing to make a drawing, the ground on which he stood gave way, and although his fall was broken by some earth which had been dug, one of his thighs received such a serious injury, that he was lame for the remainde’r of his iif and although he found some relief at the baths of Vignona near Sienna, where he went the following year, his health was never completely re-established. This accident, however, tfkd not interrupt his literary pursuits. He travelled to Florence, to Parma, and to Colorno, where, in the ducal palace, he traced a meridian, which does not now exist and on his return to Rome resumed his astronomical labours, particularly his observations on the planet Venus, whom he had been studying for a great many years. He set out by endeavouring to | ascertain her parallax by the ingenious method invented by Cassini for the parallax of Mars. This method consists in comparing the motion of the planet, whose parallax is wanted, with some fixed stars very near it, and that for some considerable space of time, but a fair opportunity of doing it seldom happens. It was, however, signer Bianchini’s good fortune to meet with one in the beginning of July, 1716, when Venus and Regulus came to the meridian so nearly together, that he could discover them both in the same field of his refracting telescope. In observing the spots of Venus, he employed the instrument before ipentioned, which he presented to the academy of Paris. His observations, however, on this planet, although very interesting to the astronomers of his age, have not been confirmed by the more recent observations of Herschel and others, with instruments of much greater power than he possessed. What he published on this subject, in 1728, was among the last of his efforts for the promotion of science, as he now contracted a dropsical complaint of which he died March 2, 1729. 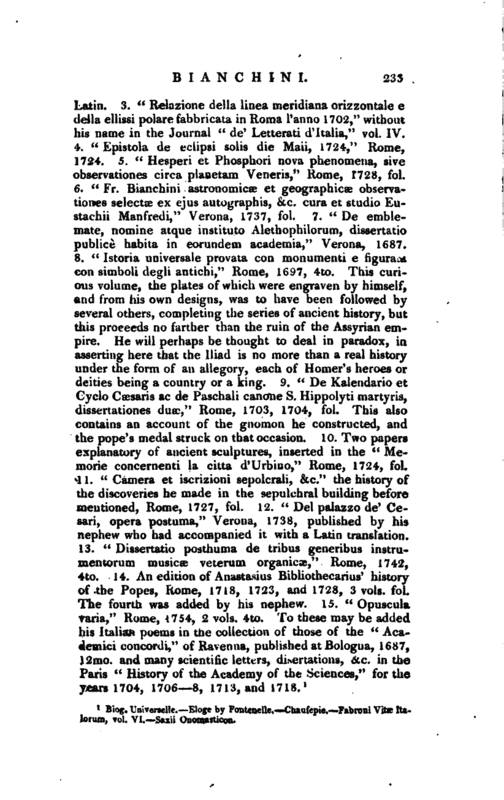 He left his property to his nephew Joseph Bianchini, the subject of our next article, and the greater part of his books and ecclesiastical antiquities to the library of the chapter of Verona. Great honours were paid to his memory by a monument in the cathedral of Verona, voted by the city, and other public marks of esteem. He was a man of extensive knowledge, particularly in natural philosophy, mathematics, botany, agriculture, history, and antiquities. He also cultivated polite literature, oratory, and poetry. His manners, easy, elegant, and accommodating, were rather those of the world than of the schools, and he appears to have been beloved, or respected, wherever he went. 1 Biog. Universeile. Eloge by Fontenelle. —Chaufepie.—Fabroni Vita Italoruno, vol. Yi, Saxjj Onomasticon.